When I vote that a question should be closed, there are (as of April 2017) 5 options. 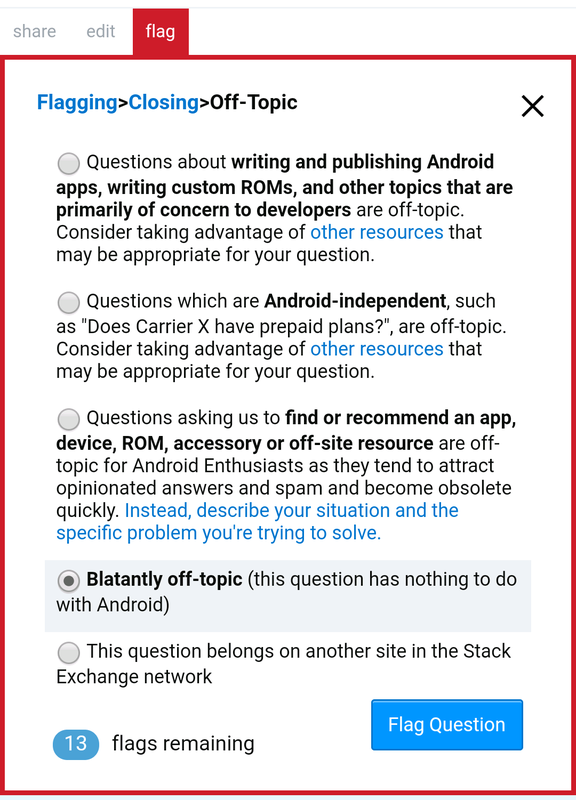 The 2nd reads "Question is Android-independent) while the 4th reads "Blatantly Off-topic". I can still recall a previous experience where someone asked a question about two iPhones. Soon the question got closed with the reason "Android-independent". But why is that question solely about iPhones marked as "Android-independent" instead of "Blatantly Off-topic"? Addition: This screenshot is taken from an Android mobile (on A.SE Main Site). There's also another screenshot that Death Mask Salesman took from the official Stack Exchange app visiting the Main site. If a moderator allows, I can flag one of my own questions with this option so that further investigation is possible. Please leave a comment if you want me to do so. Secondary question: What exactly is "Blatantly Off-topic"? Why can't moderators see this option? Edit: Andrew T. gave an answer from Main Meta site for this. Browse other questions tagged discussion bug scope flags . Voting to close a “list” or “favorite” question - Which reason should I select? Is there any limitation or requirements for questions and issues about 3rd party apps?